The secret to cool bodies and glazes is alot of testing. But how will you be able to learn from that testing without a good place to store the recipes? Document the successes and failures? Do it in your account at https://insight-live.com. A white burning body with enough added frit to produce a cone 03 stoneware or white slip for use on a matching red stoneware. This is both a slip (engobe) and body recipe. It is part of a development project during 2014 (spanning mixes from L3685A to T) to create a low fire stoneware system of body, slip (this) and glaze. This slip matches the firing shrinkage of that body (but not of standard less vitreous terracottas). This project started life as the popular Fish Sauce slip. That recipe has an unbelievable 10% bentonite. I questioned the logic of that much of a high-iron dirty cheap raw bentonite in a recipe containing low-iron low-plastic expensive Grolleg kaolin. I switched to highly plastic 6Tile kaolin and halved the bentonite, this gives as good or better whiteness. Of course this could fire whiter if Grolleg was used and plasticized with VeeGum or Bentone, but the amount of the latter needed would double or triple the cost of the recipe. The amount of whatever bentonite is used can be tuned to match the drying shrinkage of the body (using bi-clay strips). This recipe is also plastic for throwing as a body, but it needs a little more bentonite (for better trimming). In a later version of this recipe, U1, we increased the bentonite to 5%. Because at cone 03 feldspar is a filler rather than a flux, I traded it for the amount of frit required to get the degree of vitrification needed to match the firing shrinkage of the body. The frit is active, it basically is the glue that holds the fired matrix together, that glues the slip to the body. This works much better than frits in common use. The silica is here to make it easier to fit glazes and to match the thermal expansion of terra cotta bodies (on which this can be used as a slip). The frit also amplifies the color of any stains added, that means you can make colored slips from this same recipe, apply them at the leather hard stage and finish with a clear coat of glaze (start with 10:90 mix of stain and this recipe, some stains will need more, some less). This creates the possibility of single fire low temperature stoneware for brush-on glazes (although you will likely want to bisque before glazing for dipping the clear). To use this as a slip, gel the slurry so that it will hang on and stay put after dipping ware into it. Cone 03 stoneware. Red and white body and slips. Clear glaze. Cone 03 white stoneware with red terra cotta ball-milled slip and transparent overglaze. These are eye-popping stunning. They are test L3685U (Ferro frit 3110, #6 tile kaolin, Silica), near the final mix for a white low fire stoneware. The G1916J glaze is super clear. Why? Two reasons. These were fired in a schedule designed to burn off the gases from the bentonite in the body before the glaze fuses (it soaks the kiln for 2 hours at 1400F). Terra cotta clays generate alot of gases at cone cone 03 (producing glaze micro-bubbles), but here the terra cotta is only a thin slip over the much cleaner burning white body. The white slip on the left is an adjustment to the popular Fish Sauce slip (L3685A: 8% Frit 3110 replaces 8% Pyrax to make it harder and fire-bond to the body better). The one on the right (L3685C with 15% frit) is becoming translucent, obviously it will have a higher firing shrinkage than the body (a common cause of shivering at lips and contour changes). The slip is basically a very plastic white body. Since these are not nearly as vitreous as red ones at low fire they need help to mature and a frit is the natural answer. 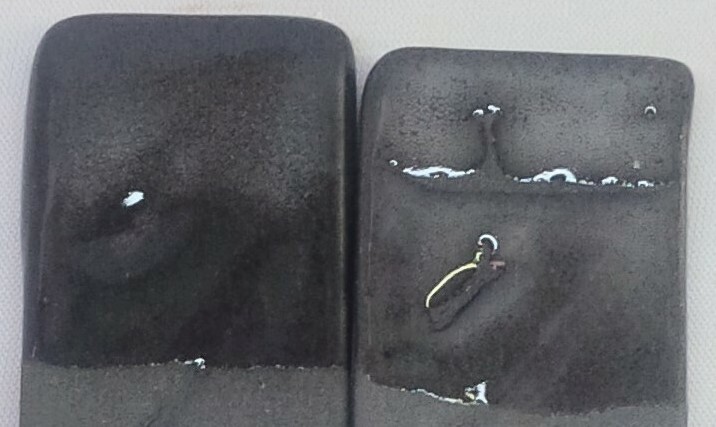 With the right amount the fired shrinkage of body and slip can be matched and the slip will be opaque. This underscores the need to tune the maturity of an engobe to the body and temperature. Although zircon could be added to the one on the right to opacify and whiten it, that would not fix the mismatch in fired shrinkage between it and the body. This is L3724E terra cotta stoneware. The inside slip is L3685S, a frit-fluxed engobe that is hard like the body and attaches well to it (engobes are often insufficiently fluxed). 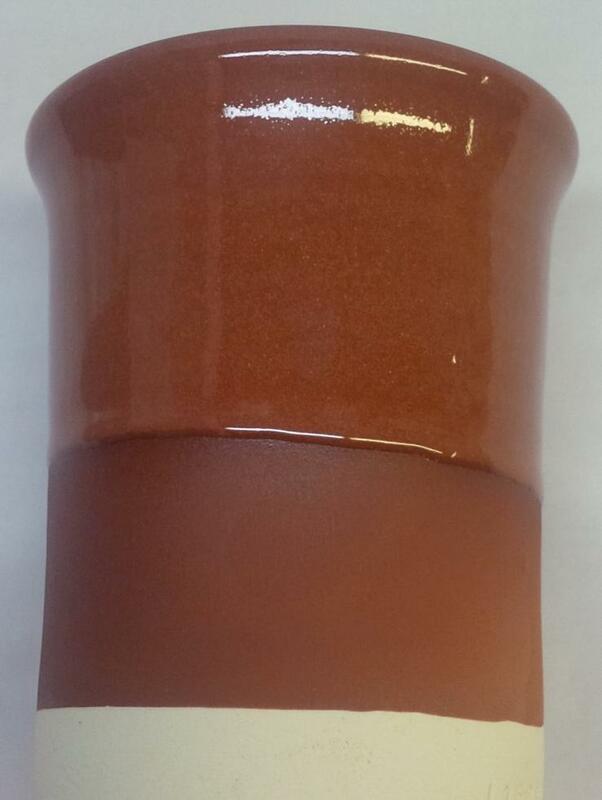 The glaze (G1916Q) is Frit 3195, Frit 3110 and 15% ball clay. The body has about 3% porosity, enough to make very strong pots. However that porosity is still enough to absorb water (and coffee). 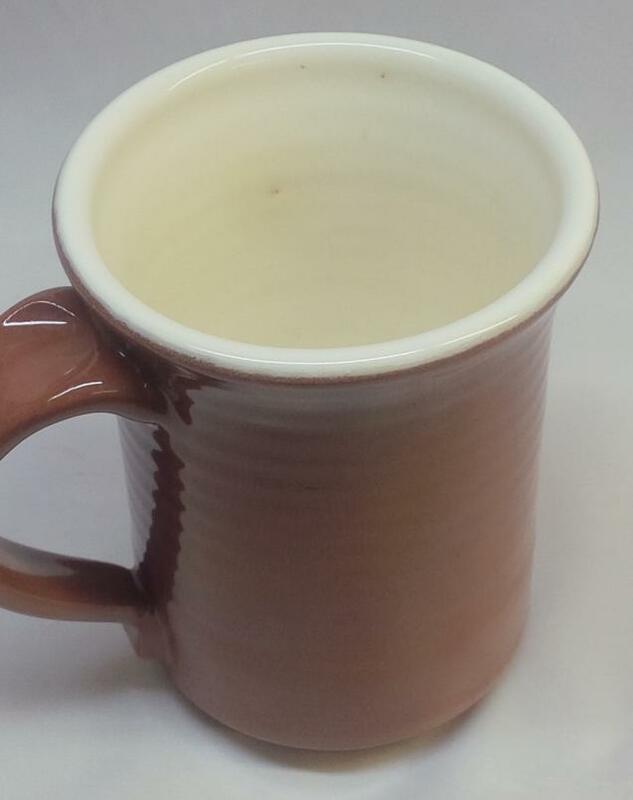 Although not too visible here, the pinhole in the inner surface has enabled absorption and there is a quarter-sized area of discoloration below the glaze. The piece could possibly be fired a cone higher, but testing would be required to see if the slip is still firing-shrinkage and thermal-expansion compatible with the body and that the body would not be over-fired. A better solution is adjust the firing curve to heal the glaze better. High temperature stoneware can easily have a 3% porosity also, so this is not just a low fire issue. 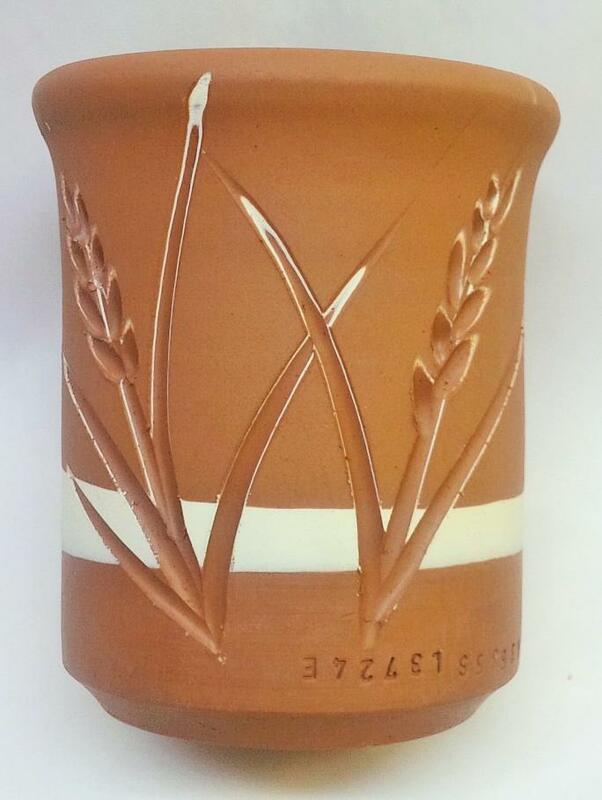 L3724F fluxed terra cotta slip applied over a white burning stoneware (L3685R) fired at cone 03. Most slips in use are not adequately fluxed and do not adhere well to the body below. The frit in this one attaches much better and even enables it to develop a sheen. Also, because of its volatility of color in the cone 03 range, variations in the shade and degree of sheen will impart an appearance like flashing. 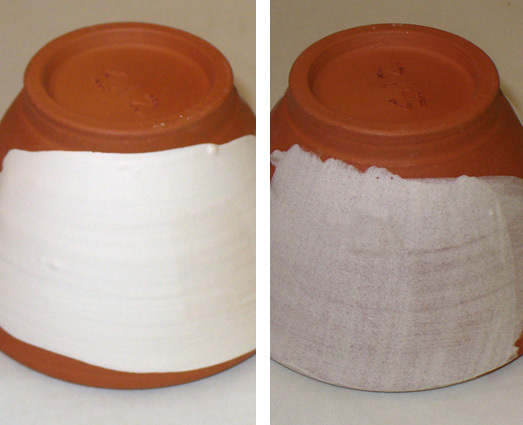 An example of a white engobe (L3685T) applied over a red clay body (L3724F), then a red engobe (also L3724F) applied over the white. The incised design reveals the white inter-layer. This is a tricky procedure, you have to make sure the two slips are well fitted to the body (and each other), having a compatible drying shrinkage, firing shrinkage, thermal expansion and quartz inversion behavior. This is much more complex that for glazes, they have no firing shrinkage and drying shrinkage only needs to be low enough for bisque application. Glazes also do not have quartz inversion issues. Each has been over-glazed using 1916J transparent and fired at cone 03. Micro-bubbles in the glaze is a problem. 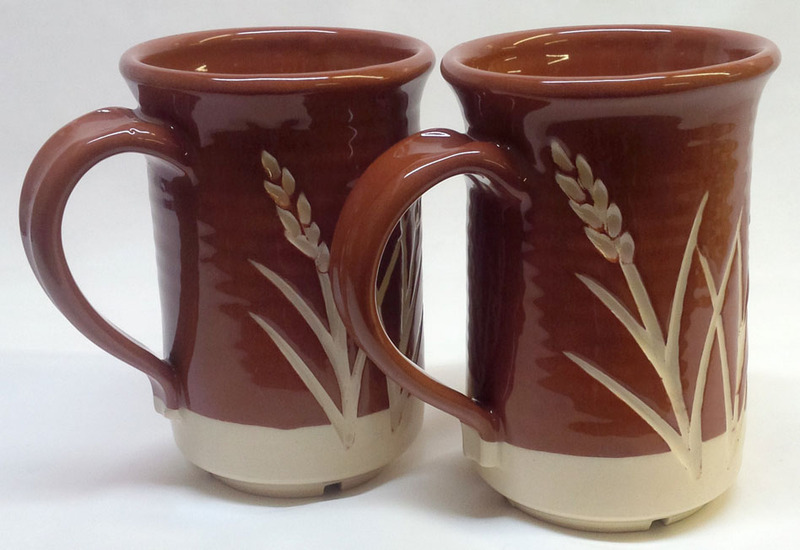 I have switched to a Redart based red burning low fire stoneware. You can see all my test data on an insight-live share here: http://goo.gl/DOd23J What are these? The white body matures to less than 2% porosity at cone 03. The red: 4%. The white can also be used as a slip on the red and the red as a slip on the white. The glaze (it is column three on the above share) works on both. They are both really plastic. This is really cool, I cannot wait to get down to the lab tomorrow to trim and slip these. What does it take to get a crystal-clear low fire transparent? A lot! 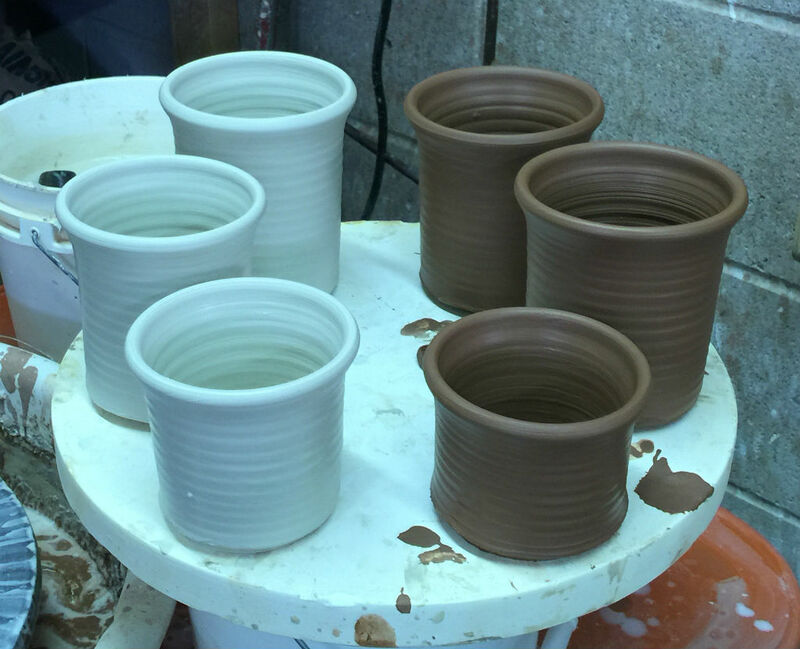 These three cups are glazed with G1916S at cone 03. The glaze is the most crystal clear achieved so far because it contains almost no gas producing materials (not even raw kaolin). It contains Ferro frits 3195 and 3110 plus 11 calcined kaolin and 3 VeeGum. 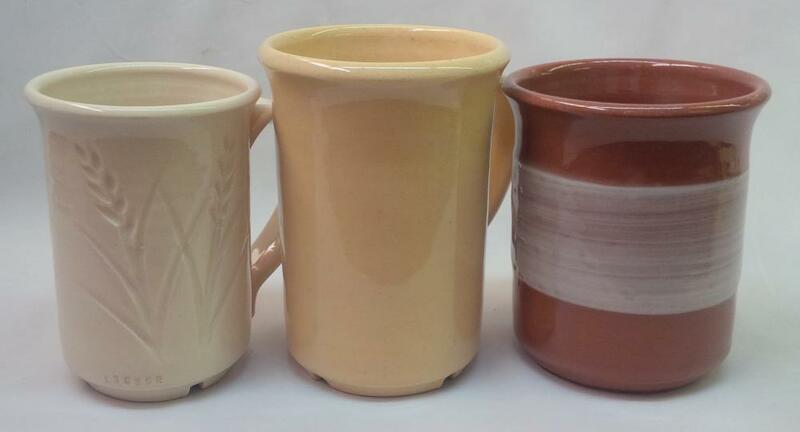 Left is a low fire stoneware (L3685T), center is Plainsman L212 and right a vitreous terra cotta (L3724F). It is almost crystal clear, it has few bubbles compared to the kaolin-suspended version. These all survived a 300F/icewater IWCT test without crazing! Micro bubbles in low fire glaze. Why? Left: G1916Q transparent fired at cone 03 over a black engobe (L3685T plus stain) and a kaolin-based low fire stoneware (L3685T). The micro-bubbles are proliferating when the glaze is too thick. Right: A commercial low fire transparent (two coats lower and 3 coats upper). A crystal clear glaze result is needed and it appears that the body is generating gases that cause this problem. Likely the kaolin is the guilty material, the recipe contains almost 50%. Kaolin has a 12% LOI. To cut this LOI it will be necessary to replace some or all of the kaolin with a low carbon ball clay. This will mean a loss in whiteness. Another solution would be diluting the kaolin with feldspar and adding more bentonite to make up for lost plasticity. At cone 03 many terra cottas will fire quite dense and stoneware-like. 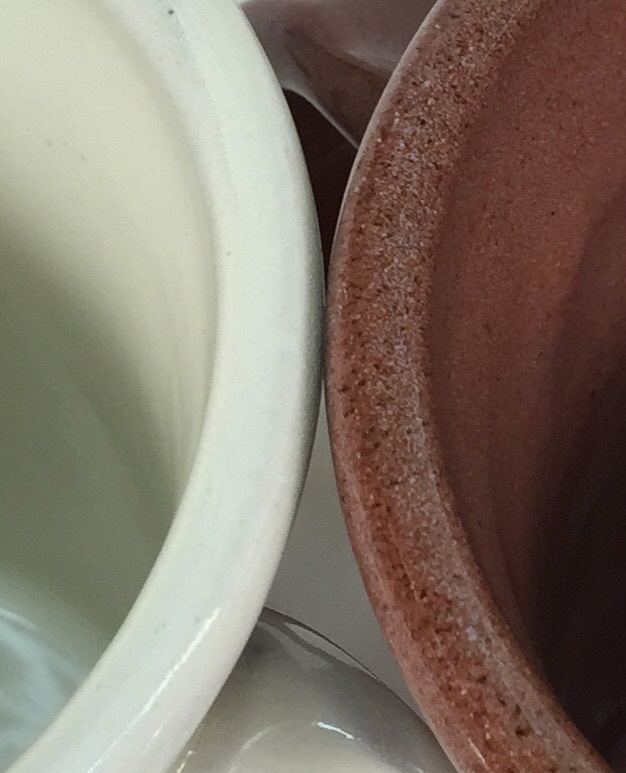 The lip of the mug on the left is covered with a vitreous white engobe (L3685U) under the glaze (G1916Q). Red bodies are much stronger at low temperatures, but do not lend themselves well to the bright glaze colors that work so well at that range. 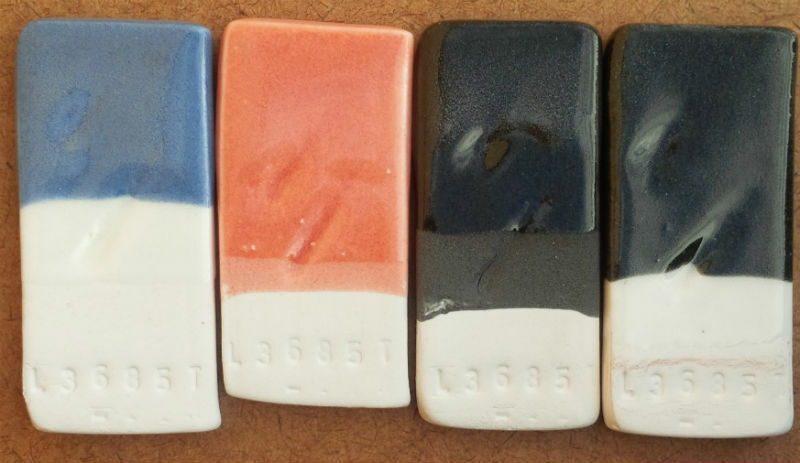 Putting an engobe on as a base enables decoration with colored slips and a clear over glaze. One caution: The engobe needs to have the same firing shrinkage as the body, to use a vitreous engobe the body needs a frit addition to be vitreous also. If you put a vitreous engobe on a porous earthenware its firing shrinkage will put it under tension and the poor bond with the body will mean quick or eventual failure. An expansion-adjustable cone 04-02 transparent glaze made using three common Ferro frits (low and high expansion) and a suspension strategy that produces an easy-to-use slurry.